File photo of Arun Jaitley. Voting in India's general election begins next week, and the result will be known on May 23. 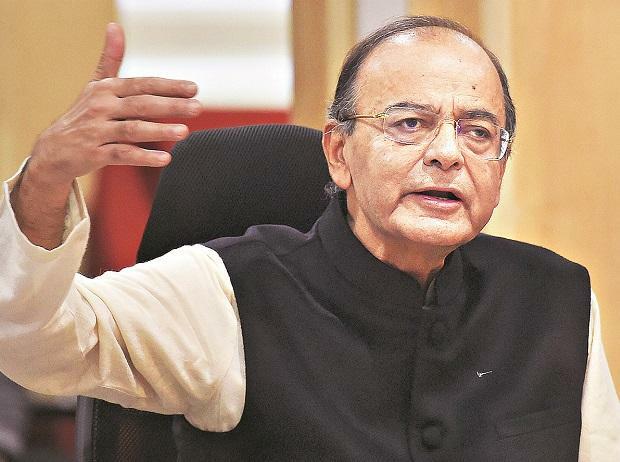 Finance Minister Arun Jaitley on Thursday said the Bharatiya Janata Party-led National Democratic Alliance will continue with the current fiscal glide path and lower tax rates, if voted back to power. “I’m quite clear on two issues at least… we had a lot of good fiscal prudence and we brought the rates down. If we are in power, we will continue with the same glide path,” Jaitley said at the annual summit of the Confederation of Indian Industry here. According to the current medium-term fiscal policy, a part of the 2019-20 interim Budget, the fiscal deficit target for 2019-20 is 3.4 per cent, and 3 per cent for both 2020-21 and 2021-22. “If back in office for the next five years, we have to set our targets clear,” he said. Jaitley also hinted that cement, which is in the 28 per cent goods and service tax (GST) bracket, will be brought down to a lower bracket. “In the last 20-odd months of the GST, except for cement, every item of consumption has come down to 18 per cent and 12 per cent from 28 per cent so it is only a matter of time that the last one also comes down,” he said. The minister said over the past five years the government did not increase tax rates, and in some cases doubled tax base and increased tax collection. The finance minister also slammed the critics of electoral bonds, calling the debate “ill-informed”. “The earlier system was opaque… who the donor was, who the intermediary was, who the political party benefitting was, none of these were known. Every stage was non-transparent. While the Election Commission (EC) has succeeded in many areas, they haven't been able to control cash. Electoral bonds are a reasonably transparent step,” he said. “The only non-transparent part is that only you know who you are distributing the electoral bonds to. Now if you ask people to disclose who they are donating to through electoral bonds, I am sure the system of cash will be back,” the minister added. On Wednesday, the government opposed in the Supreme Court the concerns raised by the EC on issuing electoral bonds and justified the changes in law saying it was “a pioneer step” in bringing poll reforms, “ensuring transparency" and “accountability” in political funding. Jaitley said India’s growth has stabilised between 7 and 7.5 per cent, and irrespective of global trends, domestic consumption is going to increase. “We have come to the 7-7.5 per cent (growth rate) range despite the fact that there is no global boom or support of any kind, and we have stabilised at that, you need to graduate further,” he added. The Reserve Bank of India on Thursday cut its GDP growth forecast for the current fiscal year by 20 basis points to 7.2 per cent. On Wednesday, the Asian Development Bank had also scaled down its projections for FY20 to 7.2 per cent, from 7.6 per cent. The economy is officially projected to grow by 7 per cent in 2018-19, the lowest in the Modi government’s five-year tenure.